Revised in 2011 to take a more hands on and applied learning approach, the Consumer Affairs Victoria Maths resource book focuses on life skills that enable young people to become smart consumers. Topics covered in the maths resource include budgeting, paying household bills, buying a car, understanding how credit cards and home loans work, money and gambling, and the nature of chance. Activities are linked to VELS and the Victorian Certificate of Applied Learning (VCAL). An interactive online resource with activities based on real-life applications of measurement in contexts such as shopping, sport and cooking. Covers fractions, scales, decimals and metric units. It teaches using integrated modelling/demonstration and practice activities and includes thirteen applied assessment tasks. 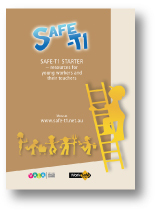 The SAFE-T1 Starter contains a sample of the print-based teaching activities found on the SAFE-T1 website. The activities focus on awareness and knowledge of occupational health and safety (OHS) and are aligned to the Victorian Certificate of Applied Learning (VCAL). The SAFE-T1 website has information about occupational health and safety and a range of teaching and learning resources including print-based resources that can be downloaded, on-line activities, film clips and more. The teaching and learning resources aim to develop an awareness of OHS through a range of activities that also develop literacy, numeracy and generic skills. The resources are aligned to the Victorian Certificate of Applied Learning (VCAL). These 11 units combine different aspects of road safety with literacy, numeracy and generic skills such as problem solving and working in teams. Each unit contains activity outlines with comprehensive guidance to teachers, worksheets and assessment record proformas. Each activity is aligned with the Victorian Certificate of Applied Learning (VCAL). Published by VicRoads, the units are available to download. Education, Grassroots Press, Edmonton, Canada. “Literacy and Industry”, 1991, (with Tout, D), CATALPA Bulletin, Vol.1 no.2. Transforming lives, transforming communities: a conceptual framework for further education.